This is the real, true story of how my best friend and I fell in love with a middle-aged couple in Mexico. Okay, maybe ‘love’ isn’t the right term. Maybe it’s more accurate to say we fell in adoration with them or we were completely overcome with life-envy. Or maybe we just wanted to grow up to be them. This is how deep our love ran: After we parted ways with this couple, we spent the next 20 minutes discussing them in Awed Tones. This couple wasn’t wandering around, hoping to Inspire People. They didn’t look deep into our eyes and impart their wisdom. They didn’t hand off a dog-eared copy of Walden. They were just two creative, interesting people, inadvertently reminding us that fun and adventure don’t have to stop when you’re 55 with a mortgage and a Super Serious Career. Totally unbeknownst to them, through no effort on their part, they inspired us to be better versions of ourselves. Which made me think about the people I find inspiring. Of course, I’m inspired by my friends who win Jeopardy or run marathons, but I’m also inspired by the friend who speaks with grace and diplomacy about her (horrible) ex-husband. I’m inspired by the friend who loudly, vocally loves WWF and the friend who volunteers with inmates. None of these people are trying to be inspirational, but by being who they are and doing what they love – they are. But we can’t be inspired by you if you don’t show us who you are. If you’re looking for a push to share the thing you’re excited about or start an important conversation or just post more photos on Instagram – this is it. You’re doing amazing things. We want to know about them. Who are are you quietly inspired by? 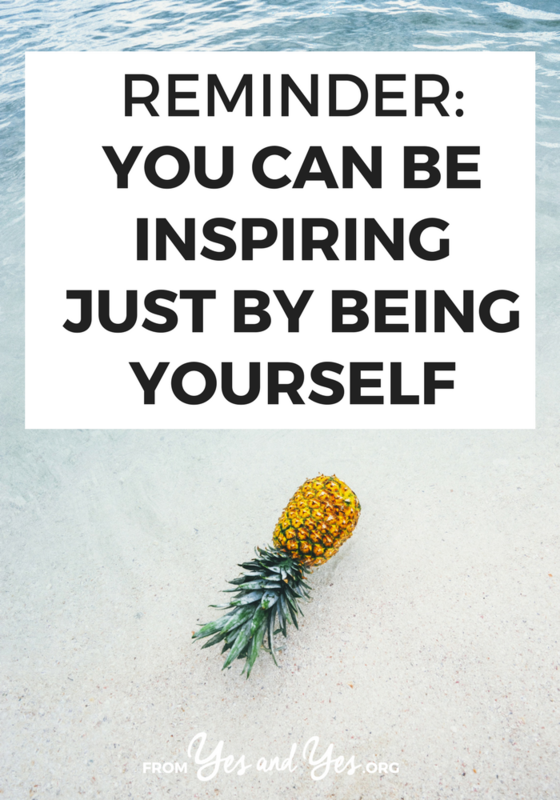 Has anyone ever surprised you by saying you’re inspiring? P.S. Life has big plans for you. Yes! I’m so glad you did! And I’m so glad we ran into them again! I’m inspired by reading this blog! U both inspire me and I hope I inspire u two, too! Ahh, I love this. (This is my default comment on your blog, it seems.) You are so right about the “you might be inspiring someone.” I’m 33 and single, and while I hope that maybe someday I’ll meet someone and get married, I’m okay if that doesn’t happen. More specifically, I think my life will be wonderful if I remain single. And a huge reason for that is the fact that my parents’ long-time friend Linda is single and in her 70s, and I’ve grown up watching her live a fantastic life. She travels, owns her own fabulous home, has a wonderful group of friends (mostly couples) who love her and support her, she owns her own business, and volunteers in her community. It’s been inspiring to see what a life can be if it doesn’t follow the “married with kids and a dog” route. Yes! It’s so nice to see ‘evidence’ that something we want is possible! And I’m sure Linda isn’t going around trying to be Inspirational, she’s just being her awesome self! This made me think of how various awesome older single ladies have unintentionally inspired me to not take crap from boys — even when I was in my early 20s, the peak putting-up-with-crap-from-boys age! — because I realized that a potential boyfriend would have to be pretty amazing to be better than the life they showed me I could have without a partner. I just found your blog (thanks bloglovin’) and I love what you’re doing here. I enjoyed this article so much. When I think of the people that have inspired my life and my thinking it has really and truly ALWAYS been the most genuine and most sincerely themselves people. Sometimes it’s even just the fact that they shared a quote that rocks you to your core… I don’t know… I just get what you’re saying and LOVE that you took the time to say it. Thanks so much for reading, Johnna! ::mwah:: You know I love you. I’ve been weirdly hanging onto this in my RSS reader instead of just reading it, but I’m glad I did. So true! I’m not sure what I’m inspiring my friends to do, but I get inspired by other people’s lives all the time—one reason I love reading personal and lifestyle blogs!